Tañada said he has never defended communists in court, but also said there is nothing wrong in doing so. MANILA, Philippines — Former Rep. Lorenzo "Erin" Tañada said he has never defended communists in court as President Rodrigo Duterte claims, but added there is nothing wrong with doing so because everyone has a right to competent counsel. In a statement, Tañada also said "dreaming about better economic, employment, and living conditions for our farmers and workers" is not wrong either. The former congressman was responding to a claim that Duterte made at a PDP-Laban campaign rally on Wednesday that he and his father Wigberto, a former senator, did nothing but "defend the left." "I have never defended communists in court as alleged by President Duterte. I am a human rights lawyer. My grandfather and father defended Ninoy Aquino during Martial Law," Tañada said. He added: "There is nothing wrong [with] defending communists in court. The Bill of Rights article of the Constitution states that no one can be deprived of life or liberty without having been provided with a good defense in a fair trial. They, just like everyone else, are entitled to their day in court aided by competent counsel." Tañada also pointed out that "there is nothing wrong with dreaming about better economic, employment, and living conditions for our farmers and workers. There is nothing wrong about believing in yourself that you can do something about it." 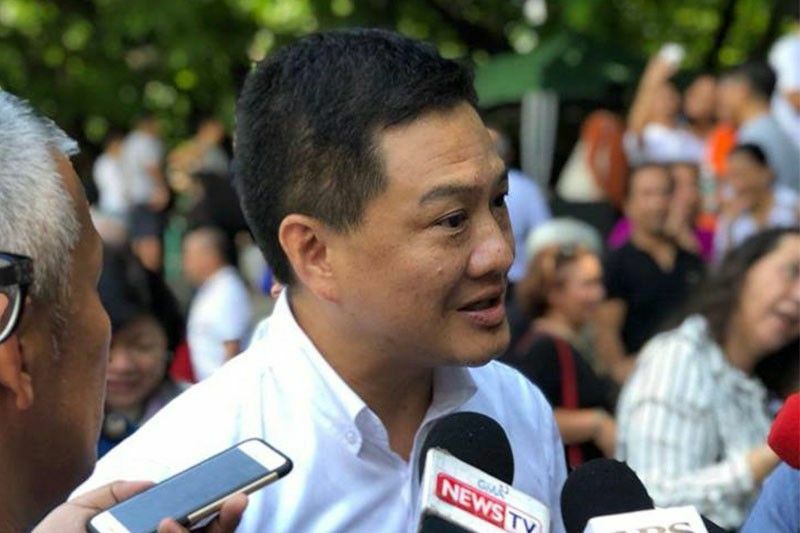 He said that that does not mean he is a member of the CPP, which the government has asked a Manila court to declare as a terrorist organization under the Human Security Act. "Some universal ideals are worth fighting for. And I will fight for them as how my grandfather and my father fought for them—with all their heart, their mind, their life," he said. According to a Presidential Communications Operations Office transcript, Duterte said in a mix of Filipino and English that Tañada and his father went "to the plenary and exposed what the military and police did to the communists." Making a pitch for administration candidate Rep. Zajid Mangudadatu (Maguindanao), whom Duterte credited with helping bring about peace in Mindanao, PCOO quotes the president as saying: "Itong Tañada na ito, wala. Sige lang depensa sa korte. And senador na man 'yan. Wala, doon sa korte, sige depensa ng mga left." Wigberto and his father Lorenzo were senators but Erin is running for senator for the first time. The elder Tañadas were recognized as nationalists and worked towards the rejection of a renewed lease for US bases in the Philippines. Erin's grandfather Lorenzo, also known as "Ka Tanny", helped found the Bagong Alyansang Makabayan. Duterte, who used to refer to himself as the "first president from the left", has turned communist into a disparaging epithet and the government has taken to labelling groups critical of the president's policies as communist rebels or supoorters. "Let me tell you frankly, in every demonstration, it’s the yellow who’s shouting for my ouster. But you will never hear it from the communists because I am the president belonging to the left actually," Duterte said in December 2016. "Yellow" refers to the Liberal Party, whom the president has since accused of conspiring with communists and the rightist Magdalo group to remove him from office. "President Duterte courted the [Communist Party of the Philippines-New People's Army] for its support when he was campaigning for the presidential post in 2016 and even appointed some leftist personalities when he assumed office," Tañada said. "He echoed the leftist stance on national issues, promising the end to 'endo' or contractualization and the distribution of Coco Levy Funds to coconut farmers. Of course, he is yet to fulfill these promises when he is already three years into his presidency," the former congressman also said.